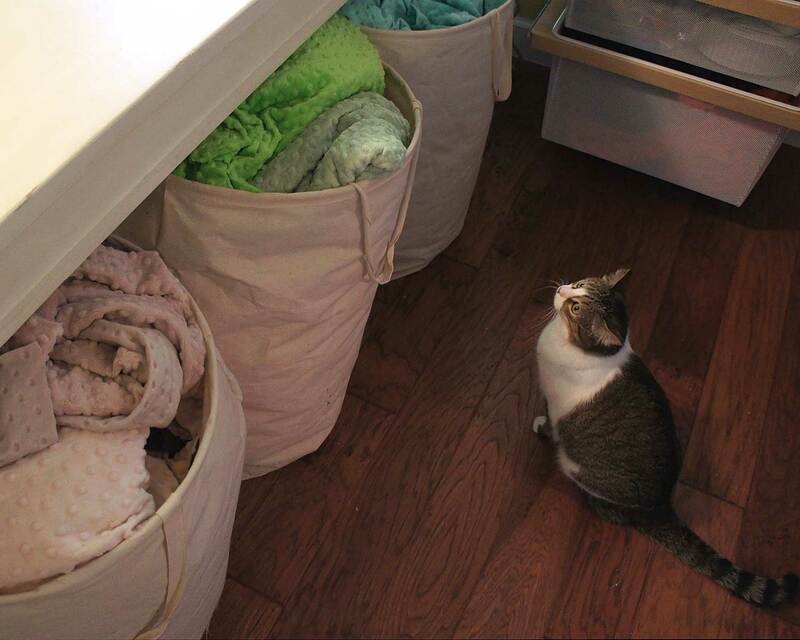 In honor of September’s National Sewing Month, I thought I would share my favorite methods of fabric storage. To store my lovely fabric stash of quilt cottons, I recently purchased some white glass front shelves from Ikea. The glass doors help protect the fabric from dust and my kitties. But the best part is that you can easily see just what you need, without digging through a stack of fabric. And to be honest, I just love looking at them all neatly folded and color sorted. It’s like a nicely organized bookshelf, except there is fabric instead of books! I have all of my scrap or small yardage quilt cottons, that I typically use for my quilt block beds, stored in small canvas bins on Elfa shelving from the Container Store. 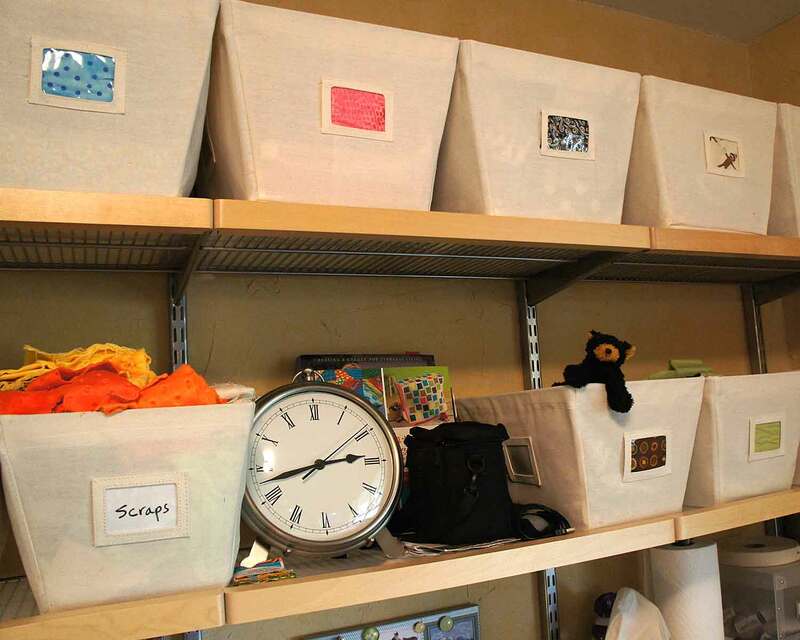 These little canvas bins are available in different sizes, and are nicely accommodated on different shelf depths. They also come with a clear plastic label area. Again I have them color sorted, but rather than type out what colors are in what bins, I just used the fabrics themselves for the label fronts, so that I know which bin to grab on my next project. For bulky fabrics, like my minky fabrics, I have found that nothing works better than these large canvas pop-up laundry bags I found at the Container Store. They are wide enough, and deep enough, to hold quite a few yards of the fabric. Since I stock 37 colors, I purchased several bags for color sorting. And, in my case, the bags fit beautifully underneath my large sewing table. An extra bonus!! My utility fabrics (canvas/muslin/batting) are stored in large clear plastic tubs with lids that I got at my local Target store. I do have some unwashed bolts in the room, but like to transfer the fabric to these tubs once washed. Choosing clear containers lets me quickly keep track of my inventory of fabrics washed and ready for cutting. Thanks to Lucy for assisting with the photography. 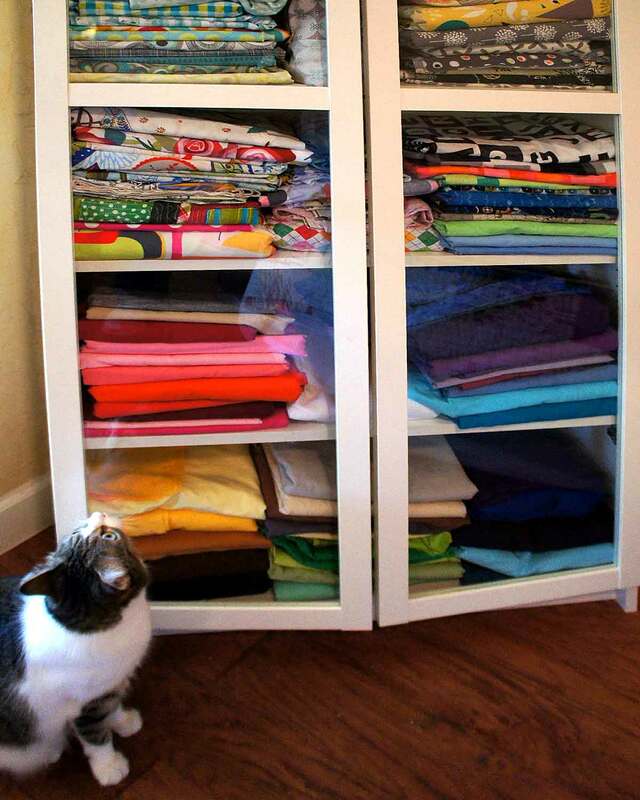 How do you store your fabrics? I would love to know! This entry was posted in Business, Etsy, Sewing and tagged Business, canvas bin, Elfa shelving, Etsy, fabric, fabric storage, Ikea, minky, quilt cotton, Sewing, shelving, storage, Target, The Container Store. Bookmark the permalink. Sian, thanks. I’m pretty organized with my fabric and supplies. But I’m going now to read your article on record keeping, because I don’t always do the best job with that. I can keep decent records, but keeping them in a timely manner is sometimes another story! Oh and thinking about catnip toys, I have plans to introduce those, and dog squeaky toys, on my site very soon!